Launch: Thursday 28th April at 6pm, at Public Record Office NI. All welcome. In ‘The Changing Face of Belfast’, Noel Nesbitt identified thirst and interest of Belfast citizens in the history of their own city, one that had been highlighted to him by one of the founding members of the UAHS, Charles E.B. Brett. 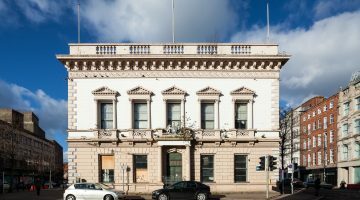 Since its publication in 1969, the need for the promotion of Belfast’s built heritage has not changed, indeed with subsequent effect of the troubles and redevelopment of Belfast, it can be seen to become ever-more necessary. So much so that Noel Nesbitt’s publication was granted a second edition in 1982. Through this exhibition the Ulster Architectural Heritage Society brings this idea back to audiences today. Belfast: A Changing City’ is a photography and map exhibition to articulate key changes to Belfast’s built environment since the 1800s. Inspired by ‘The Changing Face of Belfast’, 1969, by Noel Nesbitt, and the work of the UAHS since the 1967, it focuses on past and present photographs and maps. It is a collaborative project between the Ulster Architectural Heritage Society, the Public Record Office NI and Queen’s University. With the support of Belfast City Council, who have funded the project. Public Record Office NI (PRONI), 2 Titanic Boulevard, Titanic Quarter, Belfast BT3 9HQ. Ballyhackamore Library, 1-3 Eastleigh Drive, Belfast, BT4 3DX. Lisburn Road Library, 440 Lisburn Road, Belfast BT9 6GR. Shankill Road Library, 298-300 Shankill Road, Belfast, BT13 2BN.